you can see the legs and feet of some of the chicks under the hen. Well, it's happened again: A Nankin bantam hen came marching out of some bushes near the house this morning with ten tiny chicks. We're not really surprised. In the three years we've had Nankins here, usually two or three batches of chicks show up this way. The hens just like to lay their eggs outdoors sometimes, although most of them regularly lay their eggs in the nest boxes. As far as I can remember, this is the largest single brood I've seen a Nankin hatch. The Nankins are a very interesting breed, and according to the American Livestock Breeds Conservancy, they are critically endangered. (We are actually part of a small group of U.S. Nankin breeders. In 2010, the Oregon Zoo in Portland, OR bought some Nankins from us for their wonderful Family Farm.) 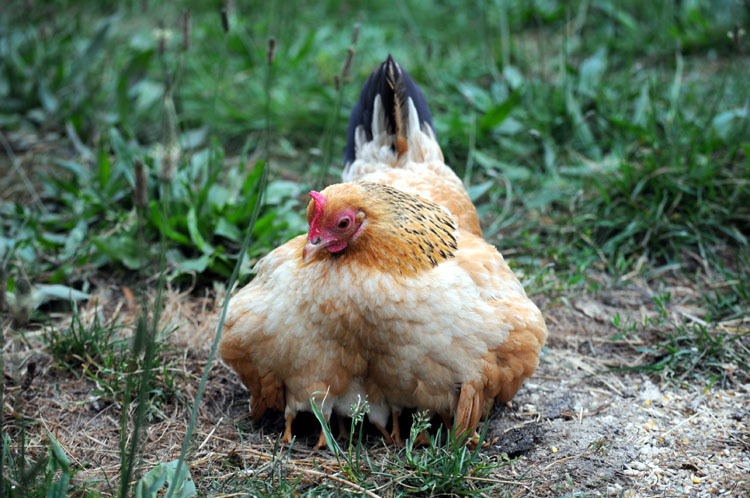 Nankins are one of only a handful of chickens that are "true bantams;" unlike most bantams, the Nankin is not a miniature version of a large breed. One of the main reasons we were interested in Nankins is their reputation for being extremely broody. Historically, Nankins were used by gamekeepers on large estates to hatch the eggs of game birds such as quail and pheasant. Two years ago, one of our relatively tiny (and quite determined) Nankin hens even incubated and hatched four Midget White turkey eggs. Nankins are small birds; adults are usually between 16 and 24 ounces. They're about the size of a smallish pigeon. Their eggs are naturally on the petite side, but quite delicious. One of my sisters actually prefers the banty eggs because she's not terribly fond of egg white, and the Nankin eggs have proportionately more yolk than regular chicken eggs. We don't normally sell our banty eggs, and sometimes we use them to make deviled eggs; they're yummy, bite-sized, and terribly cute. Anyway, here we go again. I wouldn't be surprised if another Nankin hen shows up with chicks soon. We have quite a few of them, and we don't do head counts when we tuck them in for the night. You might wonder what we do with them, if we don't sell the eggs. Well, frankly we just love them. They're adorable, the roosters hardly ever fight with each other, and there's that broody thing. We got our first Nankins round about the time we started selling our eggs, so the big picture of our farm life was still evolving. Still is, for that matter. And now the big picture has ten more chicks in it. I enjoyed reading about your Nankins! I have my first 6 Nankins in a brooder in my kids' bathroom at the moment. They are very sweet birds! I have more ordered and hope to breed them, show them, and just plain enjoy them! I love the little deviled egg idea! I will try that when we start getting eggs. Hi Michele, How's it going with your Nankins? Have you tried the deviled eggs yet? Most people I know initially don't want to deal with Nankin eggs because they're so small. Once they try them (if we can convince them to) they're usually in love with them. Keep in touch when you have time.